Lateral or medial epicondylitis is an inflammation or damage to the area of an epicondyle in the elbow joint. Two common types of epicondylitis are tennis elbow and golfer’s elbow. 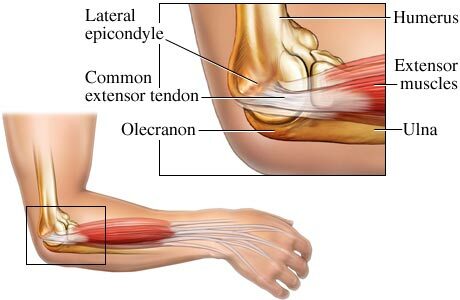 also known as lateral epicondylitis, tennis elbow is an overuse injury to the area of the lateral (outside) epicondyle of the elbow end of the upper arm bone (humerus). 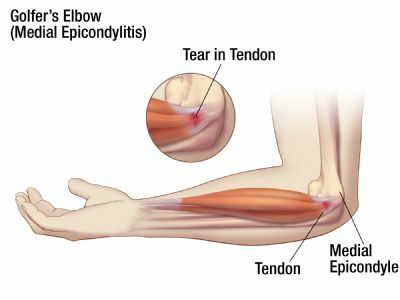 also known as medial epicondylitis, is an overuse injury similar to tennis elbow, but the inflammation occurs in the medial (inside) epicondyle of the upper arm bone. Lateral elbow pain may be up to 20 times more common than medial elbow pain. Epicondylitis (lateral or medial) may occur from occupational injuries or in multiple sporting activities. There are many other possible etiologies for diffuse arm pain, elbow pain or pain about the lateral aspect of the elbow. A skilled clinician is necessary to accurately arrive at a correct diagnosis. X-rays are helpful in explaining bony abnormalities. Magnetic resonance imaging (MRI) is useful in identifying cyst masses that may mimic elbow pain not associated with muscular tendon insertion. The MRI is also very useful in identifying the difference between epicondylitis and epicondylosis as the tissues degenerate, and would reveal subtle changes of an avulsion of the extensor carpi radialis brevis muscle (a serious and rare condition in which the tendon separates from the bone). Epicondylitis may respond to physical medicine modalities intended to reduce inflammation and decrease stress on the lateral epicondyle, including rest and avoiding precipitating factors. Epicondylitis may also respond to newer, cutting-edge technologies such as platelet-rich plasma (PRP) and stem cell regenerative therapy. Platelet-rich plasma (PRP) and stem cell regenerative therapy release healing and growth factors, and can stimulate the normal healing and regenerative response of normal tissue. These cutting-edge medical treatments that may help avoid surgical intervention. If you continue to suffer with lateral or medial epicondylitis and your current treatment plan leaves you feeling frustrated, perhaps a fresh set of experienced eyes can change your outlook. Since 1990, Dennis M. Lox, M.D has applied his personal interests in sports medicine, cutting-edge regenerative medicine and chronic pain management to helping patients increase their quality of life. Contact us for an appointment at 727-462-5582.